Photo of Hereford shed. See also the discussion about Lazonby in Mystery Picture no. 77. Is anyone able to add anything? This view of Hereford LNW shed is looking north, with the Brecon Curve line branching off to the left just beyond the GW signals. I think Lazonby in Mystery Picture no. 77 was taken from a position near this signal, looking across to the shed wall. The pointwork isn't the same because it would have been altered when the Brecon Curve was installed in 1893. 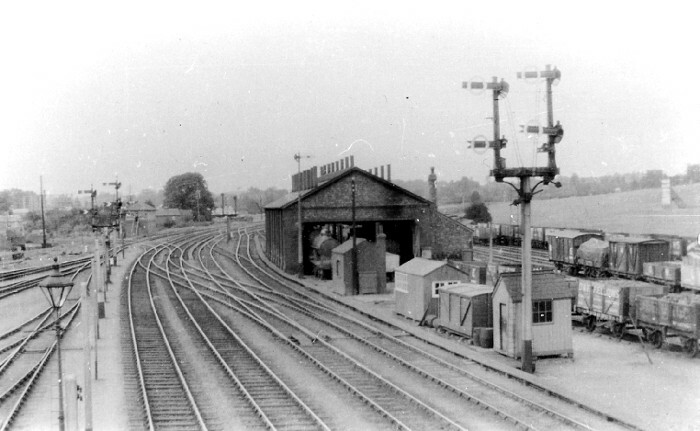 The tall poles on the left carry signal-wire pulleys; elevated signal wires can also be seen high on the shed wall in the Lazonby and GW no. 1009 photographs. Which is maybe only a coincidence. So far only photographs showing the two gable ends of the shed seem to be known, and although these show similar brickwork to that visible on the Lazonby photograph, we really need a photograph showing the west wall of the shed. Somebody must have taken one! Can anyone give me some information about the Goods Wagons in the Sidings please? I'm afraid I can't help with identification of the wagons except that the outside framed van in the second row is ex-Midland, and the inside framed van to its left might be ex-GNR, though I'm not sure about that. The only LNWR wagon seems to be the grounded body of a D32 roof door van in the foreground!